Was out in Valparaiso earlier this week. I've been hanging out in that area quite a bit the past year or so. I love it. I love the courthouse and the square and the Memorial Opera House and the shoppes and the university and the quaint B & B and the drive-in...and all the cafes and eateries, of course. I was meeting up with some of the other cast members of Listen to Your Mother for a newspaper photo shoot. On May 10, I'll be part of an amazing show that is scheduled just before Mother's Day at the Memorial Opera House. It's a national production that will be in 10 cities this year. Here's the link http://listentoyourmothershow.com/. If you live out that way, check it out...or if you live near one of the other cities where the show will take place, think about going with your mom or another mom in your life. I watched last year's show online and it was incredible. Anyway, so on to the food. After the photos, I met up with my sweet friend, Christa, for lunch. We headed for a place called Silver Spoon, but it wasn't open, so we went on to Jimmy's Cafe. It's one of those nostalgic greasy-spoon diners that is open for breakfast and lunch. I couldn't decide if I wanted breakfast or lunch...so, I got an omelet and soup combo for $6.25. Good deal. The soup was really good. It was lemon rice. 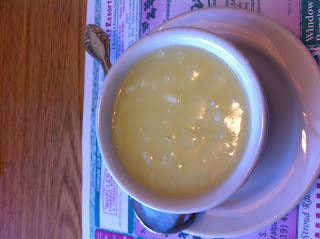 I really like chicken lemon rice soup and wondered how I'd like it without the meat, but I didn't even miss it. It was perfect for the chilly day. 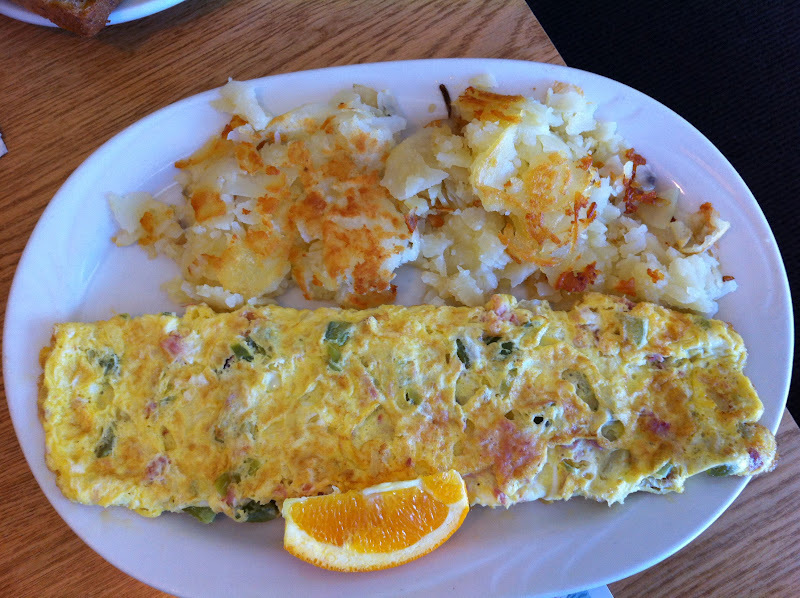 I got a ham and cheese omelet, but this was my friend's Denver omelet. And her daughter got chocolate chip pancakes that were GIGANTIC! Three of them! I would definitely pop in there again for breakfast or lunch. Don't expect trendy menu items or upscale decor. This is diner food at it's best in a quaint little place that even seems a little stuck in time. I adore places like that.